Argument Leads to Murder by Shotgun, WILD COUNTRY, July 24, 2016 - Sheriff Kenneth Hammack reports his office received a 911 call on July 23, 2016 at 3:19 am. The caller reported that he had shot his friend with a 20 gauge shotgun, stating they were somewhere in the Wild Country Subdivision. Polk County Deputies and EMS arrived on scene to find Brandon Michael Lopez, 19, of Beaumont, with a single gunshot wound. Samuel Jacobe Gotreaux, 19, of Beaumont, and a Savannah Hampton of Polk County stated Lopez and Gotreaux got into an argument at which time Lopez threw a metal object through the back glass of Gotreaux’s truck. Gotreaux exited his truck, retrieved a 20 gauge pump shotgun from the back seat, loaded the weapon with one round and fired the weapon towards Lopez striking Lopez in the right armpit/chest area. Lopez was transported to CHI St. Luke’s Hospital where he was pronounced dead by the on duty medical staff. Sheriff Hammack said after his Detectives processed the scene. Detectives transported Samuel Gotreaux to the Polk County Sheriff’s Office where he was interviewed. 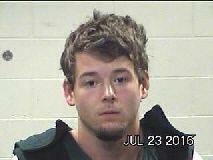 Samuel Jacobe Gotreaux has been charged with the offense of Murder and is currently being held in the Polk County Jail. At time of press, a bond had not been set for Gotreaux.